A horse that rushes fences is not an animal that “loves to jump,” as uneducated riders often remark, but rather is the horse that is anxious about jumping. Once a horse has learned to rush, it is difficult to break the habit. It may take many hours and much patience to develop trust between the horse and rider again. In fact, it is best to remove an inexperienced rider from a rusher and place him on a horse that is very dull, requiring little hand pressure and steady leg pressure, so that the rider can learn the correct use of his aids. Conversely, it is wise to put a well-educated, patient rider on the rusher, so that the horse can be properly retrained. There are several exercises used to teach a horse not to rush, all of them based on the idea of denying it the chance to run to the fences—and all of them starting from the posting trot. First, you can pull up (halt) in front of the fence, not with harsh, jerking hands that get the horse even more excited, but with quiet, but firm hands that teach the horse to be obedient. Of course, your hands should soften the feel on the reins as the horse slows down, rewarding the horse for its obedience. Secondly, you can circle on the approach to the fence until the horse becomes quieter and stays in the same rhythm. You may circle as many times as it takes for the horse to calm down. Your third option is to halt and back the horse several steps. This is effective on a quick, pulling horse; but it only works to slow down and soften the horse if you back the animal using mostly leg pressure. Pulling the horse backward with your hands only hurts its mouth and eventually will lead to a “dead mouth,” in which the nerves are so damaged that the horse no longer can feel pressure on its mouth. Remember, it is never appropriate to incessantly hang on a horse’s mouth. This, more than anything else, causes horses to rush in fright and to stop at fences. By focusing down an entire line of fences, rather than from one fence to another, you encourage straightness in your horse and make it much easier for the animal to get down the line “in the numbers”—that is, in the number of strides in­tended by the course designer. The straighter a horse is in a line of fences, the less footage the animal loses to sideways motion. Straightness, then, makes it possible for the horse to travel down the line in the proper striding without having exces­sive pace. In contrast, a horse that wanders off the correct line must increase its speed to lengthen its stride, so that it can make up for the footage lost in sideways motion. In figure A, the solid line shows the proper path between the fences, while the dotted line shows a horse making the distance between the fences longer by “bowing out” down the line. 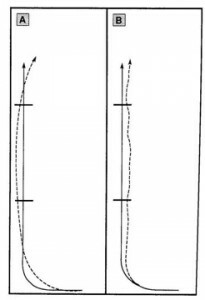 In figure B, the solid line shows the proper path, while the dotted line shows a horse “wandering” from side to side, which also increases the distance between the fences. Bowing out or wandering frequently result in the horse adding an extra stride (or even two strides) between the fences and often leads to “chipping in” at the base of the fence–i.e., taking a short step at the last moment so that the take-off spot is too close to the fence for the horse to jump well. The direct path is your best choice, so make every effort to take it! If you’re not blessed with an indoor arena during spells of freezing cold or wet weather, you must find sensible ways to exercise your horse. Your animal doesn’t need to stay in hard work during these times, but it does need enough movement to avoid colic or azotoria, also known as “tying up.” (For information on colic, see “Cold Weather and Colic” in my Blog; and for tying up, see http://www.thehorse.com/pdf/factsheets/tying-up/tying-up.pdf.) The easiest way to deal with days in which the footing is not good enough to ride is to equip your horse with a turn-out blanket (which is a special wind-resistant, waterproof blanket that has leg straps to keep it from sliding to one side), galloping boots, and hind boots and let it get the exercise it wants in a paddock or pasture during the daylight hours. (It’s alright to leave horses out at night in the summer, but they need shelter at night in the winter months.) If your horse is prone to pulling shoes, you can add bellboots, which will prevent shoe loss from overreaching, or hoofboots. Note that whenever a horse is wearing a blanket or boots, you have to monitor the situation periodically to make sure the equipment stays in place. When turning a horse out for an hour or two, leave the boots on the entire time; but if the horse is going to be outside for a longer stretch during the day, take the boots off after the first two hours, as long the horse is just grazing or walking around in the paddock or field, having gotten rid of its energy earlier in short spurts of running and bucking. Sustained pressure of boots can cause injury to soft tissue, so they are something to be used short-term, not for hours on end. Leave the blanket on if the weather is still cold, but make sure to adjust it so that it is straight on the the horse’s body and not pulling hard against the shoulders from having slid back. If your horse has had sufficient turnout time, it shouldn’t be too nutty once you get a chance to ride again. However, a horse is usually going to be a little fresh when it’s had a day or two off, so you need to be prepared for this. Start with loosening up the horse by going forward without trying to put the horse in a frame. From this, you can see just how excitable your horse is. If the animal is really cutting up, ease into a slow canter and get into two-point position (i.e., your seat out of the saddle). Let the horse canter around the arena (not hand-gallop) two or three times. Then, walk the horse on a long rein to let it relax, realize that it is a little tired, and get its brain in order. If the horse is still a little edgey, you can do the same thing again—no more than three times around, followed by a break. This should calm the horse down enough that you can get back to work at the lower gaits. Another option is longeing the horse, but this is not as good of an option if the footing is still a little slick. The tighter the turn, the more likely the horse is to interfere (hitting one leg with the hoof of the other leg) or slide down. Also, people tend to work their horses too long on a longe line, and this is a huge mistake if the horse has been out of work a couple of days. All you’re trying to do is get the horse to calm down and concentrate a little, not to wear it out at the risk of causing physical problems. Rather than longeing, you could hack your horse in a field or on trails if the footing is good enough, for this is a non-confrontational way to get your horse back to work. When your horse has once again accepted your hands, seat, and legs, it is easy to get back into more specific work routines. I hope this is helpful to those of you enduring the tough winter weather! In recently posting a video of the 2009 Medal Finals, I mentioned that a long approach to a single fence often encouraged riders to find a longer than desirable take-off spot to a fence. I’d like to elaborate on this. The pace for a hunter or equitation course is based on getting a horse to consistently take 12-foot strides, for courses in the United States are based on this as the median length of stride for horses. A short-strided horse might naturally cover the ground in 11-foot strides, while a long-strided horse might take 13-foot strides. To be as fair as possible to all, the 12-foot stride was adopted. The short-strided horse could pick up the pace to make the distances between the fences, and the long-strided horse could ease the pace back a little. When the short-strided horse increases pace, not only will the distances between the fences be covered more easily, but the take-off and landing spots will also naturally increase. The extra momentum of increased pace will encourage the horse to be bolder to the fences, so that it will take-off farther from each fence. The natural flight pattern, which is to leave and land the same distance from the center of the fence, coupled with the increased momentum will cause the horse to also land farther from the fence. Additionally, the horse’s momentum, longer stride, and bolder mindset will encourage the rider to look for a take-off spot that is farther than normal from the fence. This is called “lengthening the rider’s eye,” and that is precisely what happens when a rider makes a long approach to a single fence. The horse has lots of room to increase its pace and, particularly when the fence is being jumped toward the in-gate, the horse and rider tend to seek a long take-off spot—sometimes way too long! Conversely, when a horse decreases pace, the momentum drops, the stride shortens, and neither the horse nor rider are as likely to look for a long spot. In fact, they are both likely to seek a take-off spot that is too short. Once you know this, you can use it to your advantage, dropping the pace to help you find a medium to slightly-short take-off spot before a tight turn or a test such as halting after a fence, or increasing the pace when you know the upcoming line of fences is set for longer than normal strides. Even for horses that normally have a 12-foot stride, there can be challenges on courses, particularly in equitation and jumper classes where the strides are changed throughout the course. Some distances between fences may be based on an 11-foot stride, while others are based on a 13-foot stride. These challenges test the skills of the riders and abilities of the horses. When approaching a tight line, by decreasing the pace a little—or, in the case of an advanced rider, by collecting the horse into shorter strides on the approach—the rider can help himself find a slightly shorter take-off spot, making the landing a little shorter and the following strides a little shorter, so that everything fits perfectly in the line. When approaching a long line, by increasing the pace—or, in the case of the advanced rider, by lengthening the strides on the approach—the rider can help himself find a slightly longer take-off spot, making the landing a little longer and the following strides longer, too, so that everything fits well in the line. To make the most beautiful performance, the changes in the length of stride need to happen incrementally over the course of many strides so that the changes are barely perceptible. There is a lengthy discussion of riding distances in my latest book, The Complete Guide to Hunter Seat Training, Showing, and Judging, for those of you who are interested. At the highest level of competition, success depends upon having a detailed plan and riding through it well. If you don’t understand exactly what the test is in the various elements on course, it is nearly impossible to be competitively successful, so it is very important to have a good education on this subject.